In our last post, I discussed how post-war government intervention systematically dismantled hundreds of years of pedestrian oriented environments by forcing property owners to carve up giant swathes of their private land for parking. What I failed to touch upon was the unsustainable levels of entitlement that now exist for people demanding endless parking and traffic-free roadways throughout our city because of this decision. Like a Ponzi scheme, the pyramid eventually buckles from its own weight. What we’re witnessing today is a generational divide where outdated philosophies are represented by a leadership that refuses to acknowledge the obvious fact that their children are all saying, “I’d rather live in Austin/Portland/NY/SF/Chicago than Dallas.” Stubbornly, the parents keep saying, “they’ll come back for the jobs,” without realizing that the new jobs are starting to go where the people want to be. 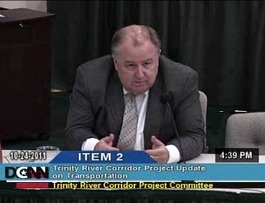 Michael Morris, head of DFW’s metropolitan planning organization (NCTCOG) and lead proponent of the Trinity Toll Road. We’re well aware of the $1.4 Billion levee toll road, and the Winfrey Point parking debacle at the Dallas Arboretum (both ironic due to their nature vs. machine conflict), but another instance also making the news is the “lack of parking” headlines in the historic (and walkable) Bishop Arts District. Every week we’re seeing one costly issue after another related to our endless pursuit of maintaining unsustainable suburban development patterns, and the solutions are always the same: take more land, and give it to cars. For some reason, the adage “When you’re in a hole, stop digging” has been completely ignored, and I’m beginning to become numb to the monthly, “I’m finally leaving Dallas!” emails that friends keep sending me. 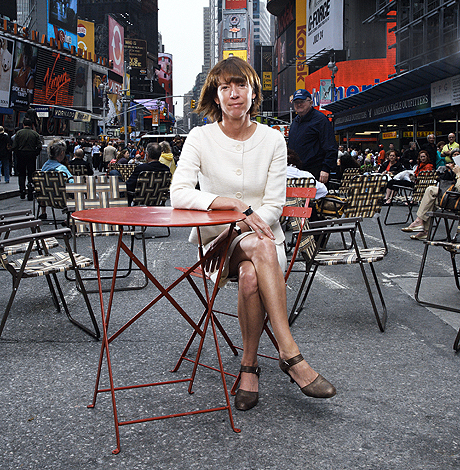 For anyone curious about what the new leadership of cities is like, check out this interview with Janette Sadik-Kahn, the head of NYCDOT and chief architect for all those major new pedestrian and bike infrastructure improvements you’ve read about throughout New York City. The “Big Apple” is the textbook example of traffic congestion, yet she’s taking away entire boulevards to create pedestrian plazas, and while naysayers claimed the sky would fall, the opposite occurred. Economics improved, traffic improved, bicycle usage increased and most importantly safety improved. While other major US cities are disincentivizing auto use and incentivizing mixed transportation models in order to balance their costly strain on infrastructure, we continue to do the reverse. 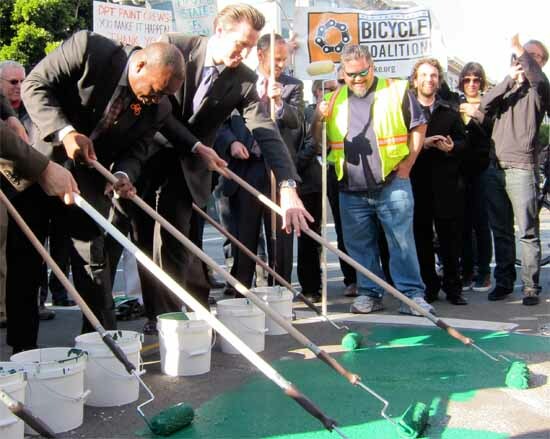 It’s obvious that our leadership will have to eventually take a stand (and a few arrows) and say,”we’re going to have to try something different,” or else they’ll be the embarrassing “Before” picture to an inevitable leader who decides to take the path that every other city around them is taking. Like a defiant George Wallace in 1963, Dallas is waiting for its Bobby Kennedy to lead a brave new path. I don’t understand why Mayor Rawlings and the rest of the like-minded so-called ‘leaders’ find these principles and concepts so hard to comprehend and appreciate. Ideas such as you offer are working incredibly well all over the globe and here in the U.S. and Canada as well. Instead of turning our beautiful White Rock Lake into an over-developed commercialized “Disneyland” why doesn’t the Mayor humble himself to learn new ways of working with others and turn those current suburban-minded intentions of his into a more modern sustainable people-oriented development placed at the Trinity River Park site. I speak of that area which is from the Design District to Downtown to the Cedars between Victory and West Dallas down to Corinth and Cedar Crest. Such a move would unite the community instead of dividing it. You don’t need an elevated tollway running down the banks of a river to accomplish this. Increase population density and activity with parks and people places in a fantastic new riverside area in the Downtown core, not in the middle of a well-established residential area like WRL. This will create tens of thousands of new jobs and new residents overnight. Use mass transit and bicycles and pedestrian walkways and bridges to bring the people to the core. We simply must keep putting public pressure on our elected officials and the Dallas development community. The cracks in their empty-suited armour and their aging, out-moted ideas are there in plain site for all to see. So are the results. Theirs are the failed policies of yesterday. We can help them, or if necessary we can make them do it right this time. The task is up to us……. I daily say I am leaving, then I watch this http://vimeo.com/24599512 and continue the good fight. I see a tied turning and we can change this city in two years. Keep showing up, call your elected officials and make a change in your block. I’m 27 and was born and raised in dallas. I recently moved to san francisco…nuff said? 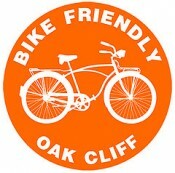 Thanks for continuing to keep us informed Jason…When I read the article about parking issues at Dallas Arboretum, my brain kept shouting can’t these folks walk, ride their bikes or take a bus…come on nature lovers get some exercise…combat obesity! I appreciate the effort to make Dallas more bike/ped friendly, but trying to compare NYC in any way to Dallas is pretty ridiculous. NYC has one MASSIVE advantage over Dallas – its brilliant mass transit system. In NYC, it’s EASIER to walk places than to keep a car. So, their efforts to make areas more pedestrian friendly should absolutely appeal to the average local. I would love to hang out in the OC much more. But, parking is TERRIBLE in Bishop Arts and there is no handy dandy subway that will get me there (and there never will be). In fact, the last time we went down to Lockhart’s for some BBQ, we wound up turning around and leaving the OC because we simply couldn’t park anywhere. So, if you’re saying, “shame on you for wanting to bring your car here!”, then you are also saying you don’t want me (or anyone else who doesn’t happen to live within a few blocks of there) to come hang. That’s fine if you are, but we just need to get that straight. BTW… You’re recent article on suburban sprawl was awesome! Keep it up. We only removed it after 1956, though it had been in operation for nearly 60 years. 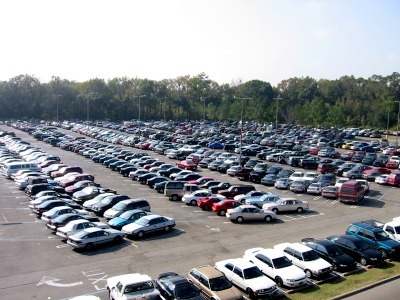 The only solution that exists to help with parking is to either create incredible multi-modal options, or tear down historic structures for parking lots. We’ve done the latter on many occassions which makes the historic areas no longer be the inviting pedestrian spaces that people love in the first place. At this point, we have to try something different, because the alternative is a zero sum game. I left Brownsville, Texas for Austin in 1994 and thought Brownsville would always be behind bigger cities. Today I see bike lanes on 6 lane roads, my mom, my brother and my sister in law ride bikes together on the city trails and my dad is going to put a bike rack in at his mixed use development. Have to admit that Brownsville, Texas with their ban on plastic grocery bags and opportunities for leaving your car behind is looking pretty good these days. Too bad we don’t also have San Fransisco’s or New York’s climate. Ever tried to sit down to a nice meal after riding just a mile in 95 degree weather? Not a pleasant experience. No ‘sink-bath” or stack of handiwipes can make you feel comforable or presentable. And please don’t sit next to me! Have you ever visited Austin? Same climate with year round activities including outdoor dining. Same goes for New Orleans, Seville, and Melbourne. How do these communities deal with the heat? Simple; shade, water features, and air flow. Also, it’s cool in the morning and at night. August might be too harsh, but that doesn’t mean we don’t develop pedestrian oriented environments because 20% of the year it’s too hot. I am from VW Brownsville TX and I have trouble finding some really good places to buy a reliable vehicle. Anyone agree?